Simultaneously released on DVD, at the cinema and shown on television for free, director Ben Wheatley was breaking from convention before A Field in England had even been seen, yet the marketing madness pales in comparison to the insanity of the film itself. Wheatley’s previous films, both black comedy Sightseers and deeply disturbing horror Kill List were far from the norm when it comes to filmmaking, certainly not in this day and age, and A Field in England pushes the boat, with a cargo of of psychedelic mushrooms, out so far it’s barely visible from shore. Come the mystifying end of the period piece you’ll be left undoubtedly dumbstruck wondering what you had just witnessed, hopelessly sounding out an explanation that’s impossibly illusive. Situated during the English Civil War, the 17th century, the film follows a band of deserters as they make their sly escape from the horrors of war, unbeknownst to them an even bigger awfulness is lurking in England’s pleasant pastoral setting. The four deserters come upon Irishman O’Neill, Wheatley collaborator Michael Smiley, who quickly takes charge of the motley crew, drugging them and forcing them to help him find a supposed hidden treasure in an unremarkable field causing all out carnage soon enough. 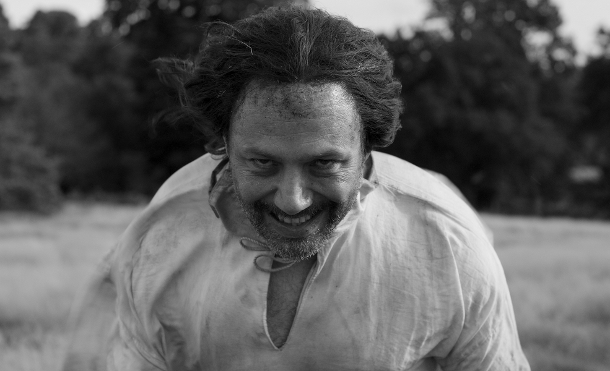 With a cast of only five, Julian Barratt of Mighty Boosh fame an ever so brief sixth, there’s an intense focus on them at all times with the setting nothing more than a field and the narrative thoroughly ambiguous, thankfully the gang wonderfully illuminate the drab black and white filter. Reece Shearsmith cut his teeth in the hilariously perverse show The League of Gentleman meaning his role as naïve, overtly religious coward and Alchemist assistant, Whitehead, is an easy transition, Shearsmith right at home in his weird English surroundings. The focal point of the feature in both role and performance, Shearsmith cleverly juggles his religious innocence against his testing companions, embodying the surreal nature of the film. His manic grin as he stuffs copious amounts of mushrooms into his face will live long in the memory as the film’s standout moment. The rest of the deserters add their own mark on proceedings, bouncing off one another as convincing band of fugitives who have little in common but their willing to escape conflict. Peter Ferdinando and Richard Glover are great as a brash, vulgar Jacob and endearing simpleton Friend, respectively. Both stamp their mark on the film as memorable support to the central duel between Shearsmith and Smiley, the duo being the source of needed comic relief amongst the haze of serious madness that engulfs the screen. Only Pope (Ryan Cutler) underwhelms with little notable about him as he fades to the back following O’Neill’s arrival. The cast work wonders with the script, creating a sense of intrigue around their characters as to who they are and what their excuses for deserting are, the early exchanges making for compulsive viewing as their dialogue dictates their circumstance. Yet as the story plays out, and the quest for the unnamed treasure takes centre stage, everything becomes disconnected with emphasis away from the characters and directed to the trippy drug induced sequences. O’Neill’s involvement heralds in the strange, unexplainable of A Field in England– a staged still shot of near photographic intensity, the first of many, marking the demise of rationality. As the story’s end nears the lunacy bursts into full flight, an extended sequence of mirrored shots, repeat images and blurred visions impressively haunting the peak of surreal, reminiscent of Easy Rider’s famous trippy graveyard scene. The striking images are perfectly bizarre, Wheatley showing again why he’s so good at crafting a dark, unnerving atmosphere. The furrow into the abnormal is slow to start but a pulsating whirlwind of obscurity by the end with all film’s aspects enveloped by a descent into mayhem. Notably the jolly mandolin tunes that litter the film are uncomfortably familiar yet hauntingly altered to be not quite right, much like A Clockwork Orange’s powerfully despicable use of classical music. The simple rural setting is transferred from idyllic tranquillity to a sinister, claustrophobic hell on earth, a testament to Wheatley’s twisted genius. A Field in England is without a doubt something completely distinctive, most unlike anything seen before but as a film with an engaging, rewarding narrative it doesn’t work, it just can’t because it’s all so incredibly strange by the end, leaving a collection of unanswered questions the size of the field they are grown in. The madness is irritatingly inexplicable, not surprising such is the abstract nature of the narrative, leaving the audience scratching their head as to whether they missed something amongst the mumbled Olde English the characters speak, or in fact there were no answers ever forthcoming. 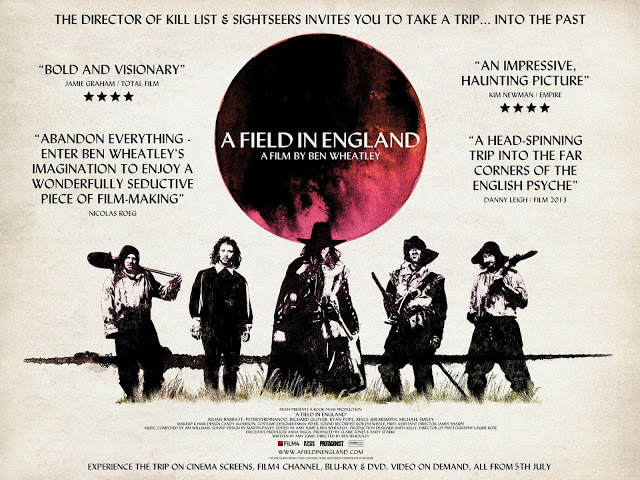 Even if you watched a Field in England another ten times you’d be unlikely to have fathomed anything closer to the film’s meaning, perhaps an open interpretation is the idea but it’s all just too bloody strange to hazard a sensible guess, only Ben Wheatley can explain what lies at the film’s heart. Despite its incomprehensibility A Field in England is a great watch as refreshing, memorable piece of cinema, an odd little film that deserves plenty of praise for being something very different. The brilliant concoction of engrossing performances with Wheatley’s unique ideas make for great entertainment but equally the director’s mushroom fuelled vision is too much to make head nor tail of.